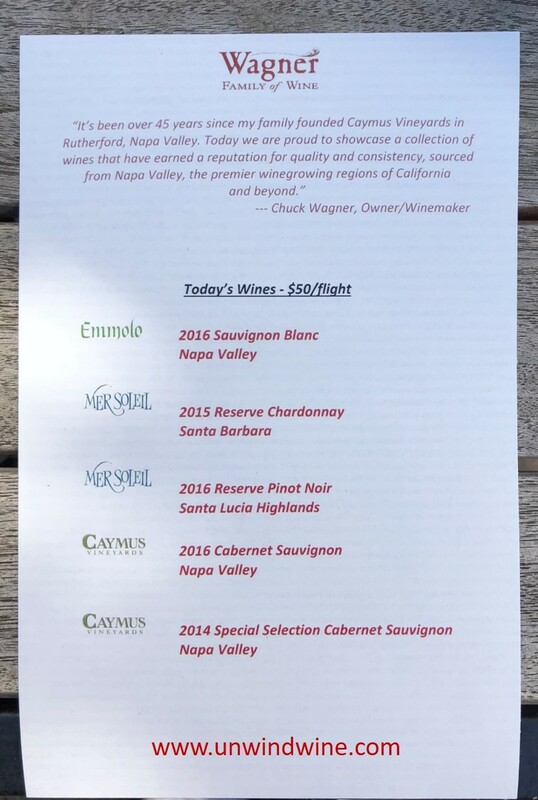 Our last tasting appointment of our Napa Valley Wine Experience 2018 was a private tasting at legendary Caymus Vineyards, are one of the most well known and established brands in Napa Valley dating back to 1972. Since then their production has grown from 240 to 65000 cases per year. They're most known for Caymus Cabernet - their two Cabernets Sauvignons; “Napa Valley” and the venerable “Special Selection”. Both are crafted by winemaker, founder and patriarch Chuck Wagner. Caymus have managed to continue to produce respectable Cabernets despite their large growth in production. Both wines are known for early gratification, drinkability when young, as well as aging ability. 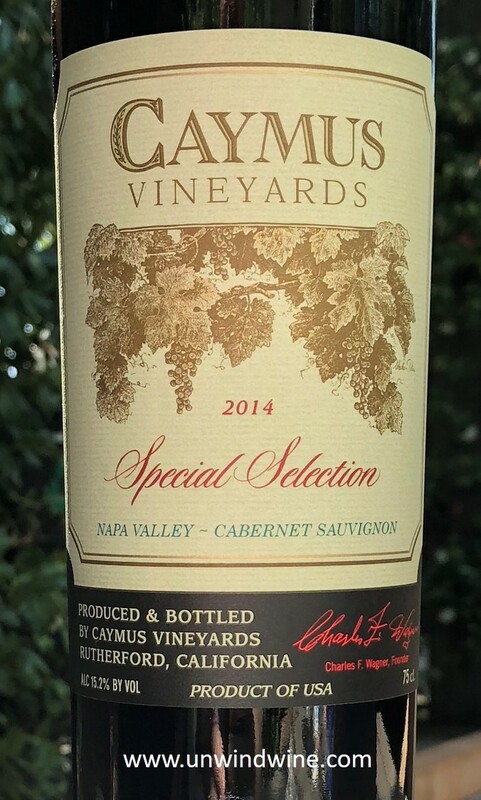 We hold many vintages of Caymus Cabernet and Caymus Special Select dating back to the 1990 vintage. 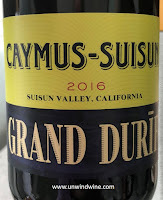 A couple years ago, for their fortieth anniversary, Caymus changed their packaging with a new label design and new foil that prominently featured the number '40'. Each year since, they increment the number representing the number of years that they have been producing Caymus Cabernet. We purchased a collection of that label and every one since, as our wedding anniversary coincides with the same number of years as Caymus. Ever since, we serve Caymus Cabernet as part of our 'shared; anniversary celebration. That first year's celebration is featured in this linked blogspot post. Last year's anniversary celebration was featured in this linked blogspot. 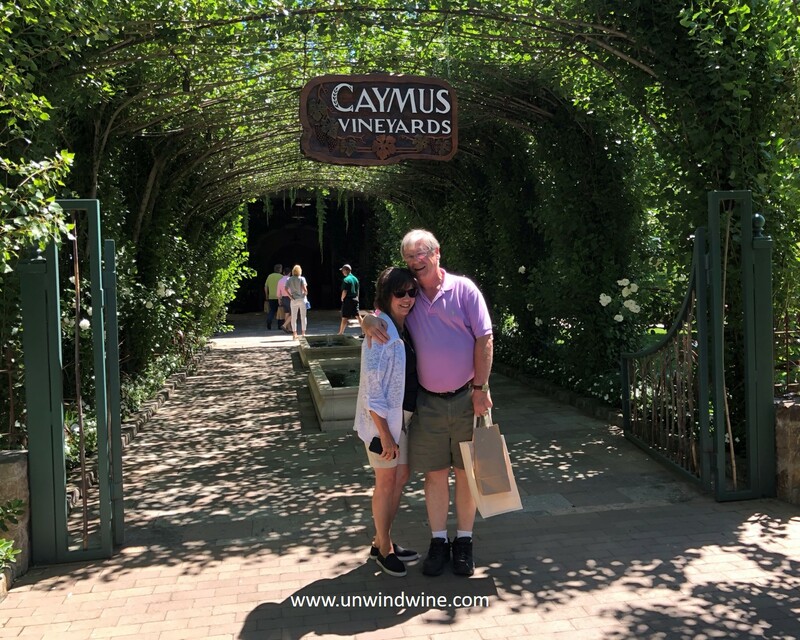 Caymus Vineyards remains 100% family-owned by the Wagners, elder Charlie, Lorna Belle, and Chuck who are joined by the next generation, Chuck's two sons, Charlie and Joe, and daughter, Jenny. They farm about 350 acres of choice Napa Valley vineyards. 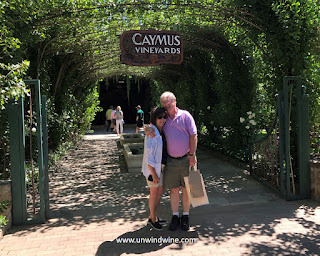 Caymus is named for the historic Mexican land grant known as Rancho Caymus, given to George Yount in 1836, which encompassed what eventually became the town of Rutherford and much of the surrounding area. 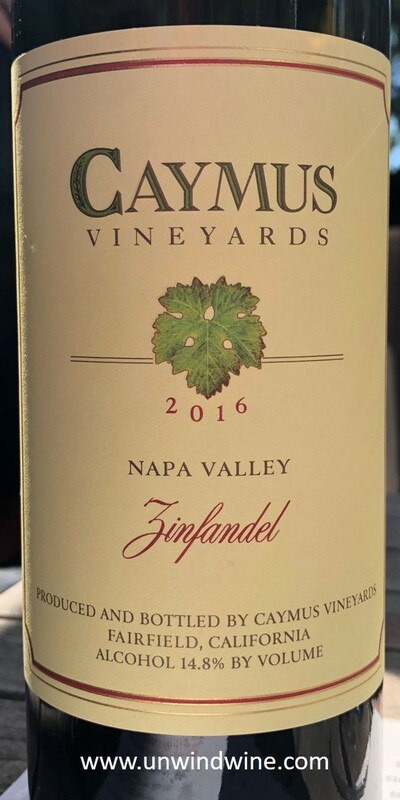 The Caymus portfolio has grown with new labels that include the Emmolo and Mer Soleil brands. The Emmolo brand is named after the mother of Jenny Wagner. Emolo wines are sourced from fruit from the family Estate north of the Caymus property in the Rutherford district of Napa Valley. Jenny’s great grandfather emigrated from Italy in 1923 to settle in Napa Valley and planted vine stock nursery. Her grandfather planted vineyards in the 1950’s and her mother started producing Emmollo wines in 1994. 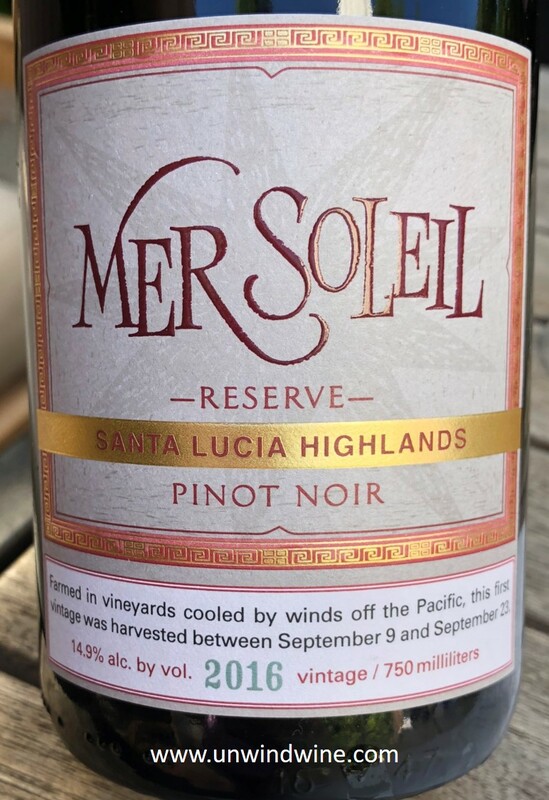 The Mer Soleil label is the handiwork of Charlie Wagner. He sources grapes from a number of properties from Sonoma to Santa Barbara. Mer Soleil means sea and sun referring to the coastal vineyards from which the grapes are sourced. The brand tends to feature Burgundian grape varietals Pinot Noir and Chardonnay which are more suited to such sites. Like some of our other producer visits this week, we scheduled a private tasting at Caymus to experience some of the brands' labels that are limited production and available only at the winery or directly from the producer. 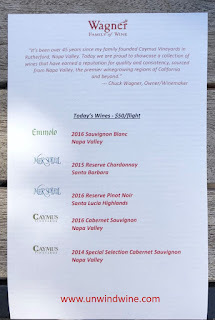 Of the six wines we tasted, only two are such offerings, the Mer Soleil Santa Lucia Highlands Pinot Noir and Caymus Estate Napa Valley Zinfandel. In retrospect our tasting visit was a source of major agitation and aggravation when we learned after the fact, reading on their website, that the tasting fee is waived with the purchase of four bottles of wine. We purchased three, one, and would've naturally bought another since it would've essentially been gratis when factoring in the tasting fee. It would've been nice had we been offered this or told of this policy when were there. Our image of the brand will forever be tainted by this shortsightedness as we feel shorted. 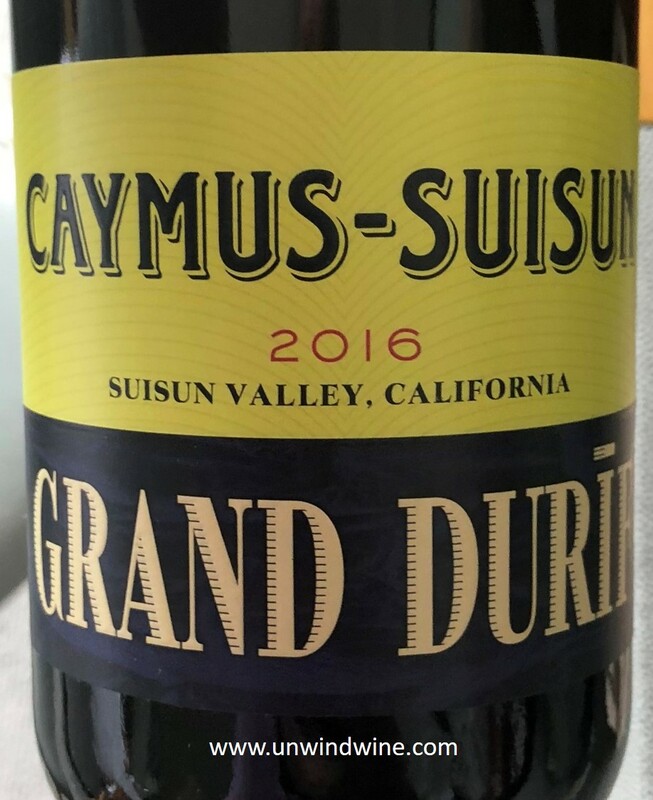 Note we purchased the labels not in general or limited in distribution, the Pinot and Zinfandel, and another label not tasted, Caymus-Suisun Grand Durif, all of varietals we don't generally collect for longer term cellaring. The Bordeaux varietals we normally collect and drink that were tasted, are generally available in distribution and at our local merchant, hence there was no need to acquire at the winery to ship home. This is the first inaugural release of this Pinot Noir label, sourced from vineyards in the Santa Lucia Highlands appellation in coastal central California. This was garnet colored, medium bodied, bright flavors of cherry, strawberry and subtle cranberry accented by a layer of bacon fat, earth and spices with soft tannins on a lingering finish. We hold this wine in several vintages including the 1990 release which was Wine Spectator wine of the year and is birth year wine of Son Alec. The label says this is produced by Caymus in Fairfield, CA. This is a very limited production label available only at the winery that has actually been produced since 1975. According to our server, this is a favorite of Chuck Wagner, personally produced since the earliest days for personal consumption, and available in small quantities from the winery direct. We also purchased this wine to try as we're fans of Sirah and Petit Sirah. Fruit for this wine is sourced from the Suisun Valley located in the California Central Valley about forty minutes east of Napa Valley. The fruit for this wine is the Durif grape varietal which is also known as Petite Sirah. Watch for our tasting experience.